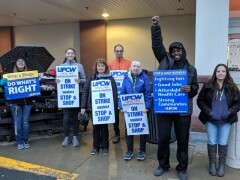 Stop & Shop workers strike across New England | Fight Back! Northampton, MA - On Friday night, April 12, over 20 Stop & Shop employees were gathered outside the King Street store for the second day of a strike called by United Food & Commercial Workers (UFCW) at stores across New England. Currently there are over 31,000 UFCW workers protesting proposed cuts to health care, take home pay and customer service. Solidarity with the strike spread quickly, as the usually packed parking lot was almost empty. Potential customers were turning away one by one as the workers explained their situation. Earlier in the day, one woman stood in solidarity at the picket line with a sign offering to drive people to the nearby Big Y for those unable to access another grocer by foot. Community members brought food and coffee to the picket line throughout the day. “They’ve already started bringing scabs in through the warehouse,” a woman union member said. But in this same warehouse, trucks from Peapod (a non-union grocery service owned by Stop & Shop) have been sitting full for 24 hours while there are no experienced workers to unload the trucks. A union cashier who is 18 and still in high school full time, explained that she works 30 hours per week at minimum wage ($12 per hour) to raise money to attend college without a scholarship. She and others expressed frustration at corporate management’s decision to cut hours for employees, to the dismay of customers who had to face longer lines and slower service. Lisa Rogers, another union cashier at the King Street location, complained that management says the workers are “overpaid.” “I’ve been here 18-and-a-half years and I make $14 an hour,” she said. “Our hours have been so cut back that we have long lines, customers complain. But they’re the only hours we’re allowed to have.” She explained that sick time too has been cut, and unused time no longer rolls over or is paid back but instead disappears at the end of each year. Teamsters Local 404 in Western Massachusetts and Northampton Firefighters Local 108 are supporting the striking workers. The strike is ongoing and solidarity is growing.